Discernment can be described as a process of spiritual exploration – a time in which a man or woman acknowledges God’s call to serve Him in a particular vocation. If you are inspired by St. Francis and his example, then you may have a vocation to the Capuchin Franciscans. A person who is interested in becoming a Capuchin Franciscan remains in contact with the Vocation Promoter who helps him discern his call through visits to our fraternities, conferences and “Come and See” Weekends. This period of discernment can be as long as needed. Candidacy is an opportunity for men who are interested in a Capuchin vocation to build a relationship with the friars during their time of discernment. During this period (which can vary in length) a candidate will spend weekends with us, receive spiritual direction, and keep in regular contact with the friars, particularly the Vocations Director. During this period they seek the guidance of the Holy Spirit to help them discern if the Lord is calling them to enter postulancy. 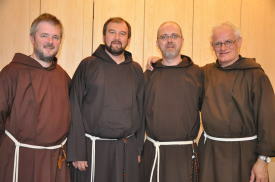 Postulancy is the first stage of formation as a Capuchin Franciscan Friar. It is a time of initial discernment. Currently our postulancy is in our Raheny Friary in Dublin. While living at the Friary, a postulant comes to know the Capuchin life better better through sharing in the lived experience of the community and prayer life of the Friars. During the 10 month period a postulant learns more about his Catholic Faith, St. Francis of Assisi, the Capuchin Order ,religious life and himself through in house and external classes, dialogue with his director and input from other friars. Postulants also have an opportunity to gain some experience of pastoral ministry in our Day Centre for Homeless People. The Postulancy usually last from September until May. Listen to Postulant, Daniel, speak about his experiences as a Capuchin Postulant in the Irish Province. This interview is part of our ‘Under the Hood’ series of Podcasts. The novitiate is a structured year of prayer, and some ministry, in which the novice enters more deeply into the process of his discernment of Capuchin Franciscan life. The novitiate year officially begins with Investiture, a ceremony in which he is clothed in the Capuchin Franciscan habit. The novice furthers his understanding of Capuchin life through classes on the Rule and Testament of St. Francis, Capuchin Constitutions, Capuchin History, Franciscan Sources, Franciscan Prayer, Writings of St. Francis and St. Clare, the vows of poverty, chastity and obedience. He meets regularly with his formator (Novice master) and spiritual director who guide him through his discernment as a Capuchin Friar. At the end of the year the novice professes temporary vows of poverty, chastity and obedience. These vows are taken for three years and then renewed annually for a further two before making final profession. This excellent, and often humous video, gives a sneak preview of life in a Capuchin Novitiate. 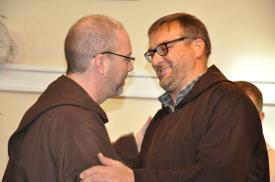 After the novitiate year the newly professed friar moves to a Capuchin Community and begins two years of Post-Novitiate formation. His first year is devoted to a deepening of his novitiate experience through contemplation, study and ministry. During his second year the friar builds on these experiences through more intensive pastoral ministry. Depending on his program, a friar in the formation is involved in studies and ministry in preparation for Solemn Vows, his final commitment to God and the Capuchin Order. Those friars who feel called to the priesthood undertake the necessary studies to meet the requirements for Ordination. This usually consists of two years Philosophy study and four years Theology. 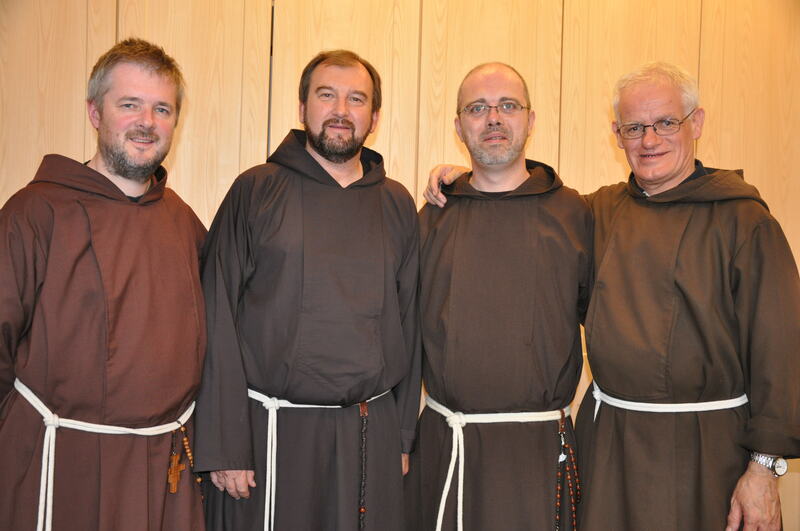 Not everybody feels calls to Priesthood and , as Capuchins, our primary vocation is to live and minister as Brothers. Using the gifts and talents God gave to us is very important and at all times the Friar is encouraged, with generosity, to develop these talents and place them at the service of the Fraternity and the Church. If a Friar doesn’ t feel that God is calling him to minister as a Priest, then he is encouraged to discern and make known how he feels God wishes him to minister. In consultation with his formator (the friar assigned to accompany him), he chooses a vocational path which will allow him to minister in a way which builds upon his talents, gifts and interests.